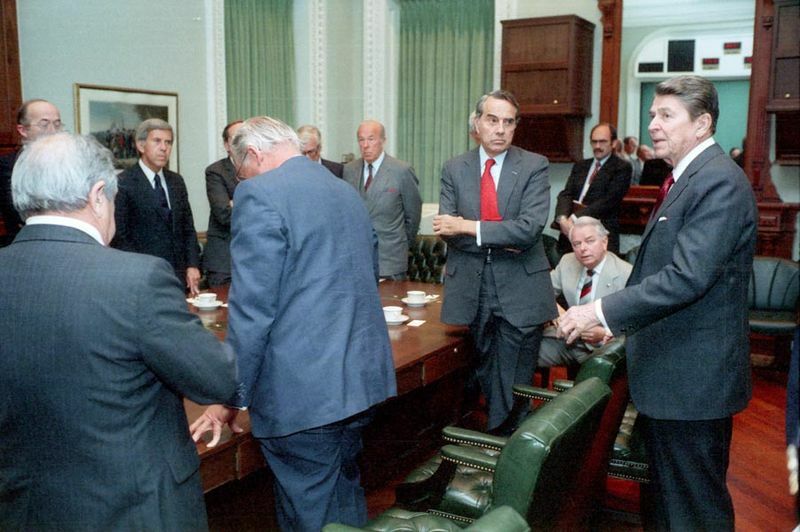 President Reagan consults bipartisan Congress members about the strike. The report lists the anti-US illegal activities of Libya in Europe, Africa, the near and far-east, Central and Latin America as well as direct threats against the US. The Reports specifically names the activities of Qaddafi in Nicaragua and his support for the Popular Front for the Liberation of Palestine – General Command. Evidence: a pair of intercepted cable transmissions from the Libyan People’s Bureau–its embassy–in East Berlin. The US Senate ratified the Supplementary Extradition Treaty (Supplementary Treaty) between the United States and the United Kingdom. Alleged Libyan Plot to Bomb US Embassy in Lomé, Togo. Around this day – DDI Richard Kerr and Tom Twetten are sent to the White House to explain what the CIA could do “to apply psychological pressure on Gaddafi”. Twetten said it would be no problem for the CIA “to plant false stories in publications abroad” to unnerve Gaddafi. The information was discussed in a four-States mini-summit. Although Senegal is not a member state of this summit, its defense minister was invited. Reagan signs NSDD: Deception and disimformation. Le Monde Un nouveau raid sur la Libye? Attempted Coup in Togo; “MST-13 Timers appearance” . US team brings one timer back to Washington. Keep in mind that without this MST-13 timer, PT/35(b) would not have helped the Lockerbie investigators since it would never have been matched to a MST-13 MEBO timer. Elaborate Campaign Included Disinformation That Appeared as Fact in American Media. “Disinformation Program” widely covered in the US; 5 stories in the NYT, 3 on the front page! Senator William S. Cohen, Republican of Maine, a member of the Senate Intelligence Committee, said he grew worried last summer while reading news reports indicating that Colonel Qaddafi had become increasingly unstable and was facing internal threats. Bernard Kalb resigned today as chief spokesman for Secretary of State George P. Shultz in protest of the government’s “disinformation” program directed at Libyan leader Moammar Kadafi. The Lebanese magazine Ash-Shiraa exposed the Iran-contra scandal.